Route 66 is far more than a mere highway. It does more than simply link Chicago with Santa Monica. It is a magic portal where the past and present blend together seamlessly and where barriers of language and culture melt away over pie and coffee. It is America’s biggest small town where everyone knows your name. I have been a bit delinquent with blog posting this past week, my wife and I have been traveling the world without leaving home. This is a relatively common phenomena for folks who reside along Route 66. There was also the addition of a grandson last Thursday, a festival that provided a few opportunities for sharing dinner with good friends, preparation of several reports, negotiations with the publisher for a new project, cover design tweaks for the long overdue guide book to the Kingman area, a meeting with the marketing manager at Ramada Kingman, travel arrangements for our pending road trip to the Miles of Possibilities Conference in Edwardsville, and planning sessions for the Celebrate 90 initiative. To say the very least, my dearest friend and I have been a bit on the busy side. The first annual Best of the West on 66 Festival is now history. As it was built on the foundation of the Andy Devine Days events, which were built on the historic Digg’n Doggie Days festival, organizers were able to avoid a few of the pitfalls that plague most first year events. This is not to say there weren’t frustrations, snags, issues, or problems. However, overall these were relatively minor and I am rather confident that with the exception of the record heat, these problems will be resolved in time for next years festival, especially as plans . The annual parade featured more than 125 diverse entries, a new record, and visitors from Europe and China, as well as from Phoenix and Las Vegas, got a taste of classic small town America that was worthy of Norman Rockwell as concerts provided a bit of musical entertainment. 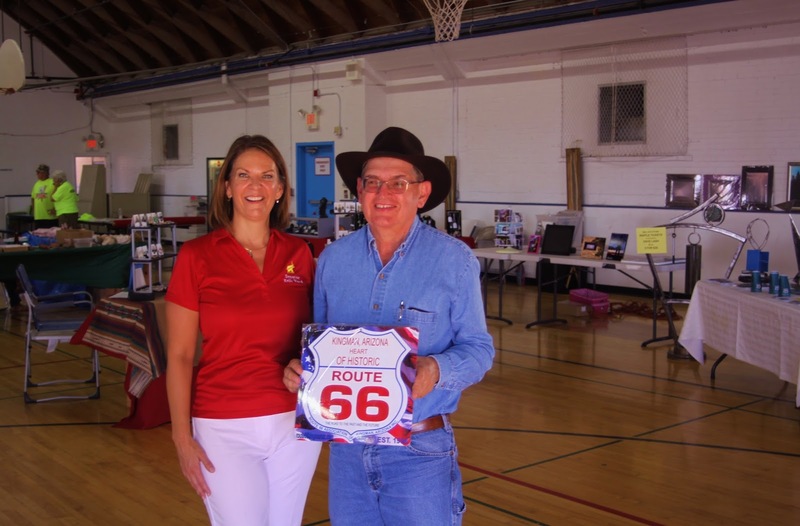 Native Americans shared traditional dances, State Senator Kelli Ward was presented with an honorary membership into the Route 66 Association of Kingman, and a new slate of inductees was officially added to the Route 66 Walk of Fame. 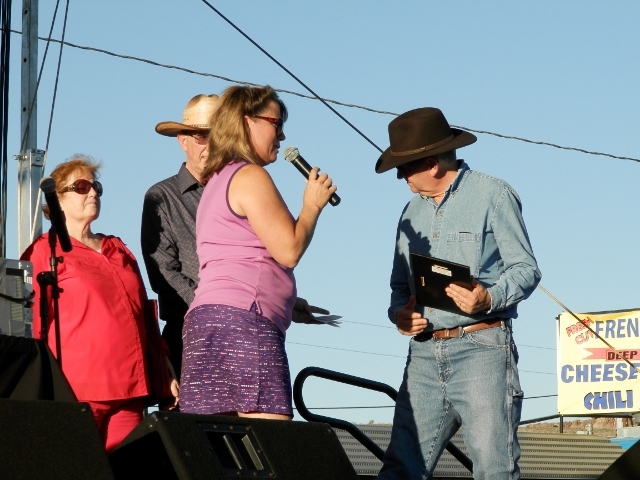 The Saturday evening rodeo sponsored by the Kingsman, a separate event at Mohave County Fairgrounds, had record attendance, and to celebrate the transformation of the corner of Fourth Street and Andy Devine Avenue, a sculpture by Donald Gialanella was introduced. Perhaps the most glaring problem was one that is a common issue at many of these events – signage for the exhibitions hall and this event was no exception. Best of the West on 66 Festival. Still, there were a lot of smiling faces and at the end of the day, friends gathered at Ramada Kingman for dinner, a few cold drinks, and some hearty laughter. Like the road itself, it is the people that make an event memorable as well as special. It is also the people that made our week special. First, there was the arrival of our latest grandson last Thursday. Then there was the dinner with friends on Saturday evening, a breakfast with our son and friends at Rutherford’s Route 66 Family Diner on Sunday morning, and on Tuesday we kicked off the day with a visit from our friends Akio Takeuchi, a Japanese author and Route 66 enthusiast as well as a member of the Japanese Route 66 Association, and his family. Even though he does better with English than my wife or I do with Japanese, we were quite grateful for Google translate. After coffee at Mr. D’z, as per request I facilitated a meeting with James Gross at TNT Engineering as Akio wanted to present the owner with a copy of his book that contained a photograph of Bob Waldmire painting the mural on the facilities machine shop wall. Bob Waldmire used this facility a great deal to keep his legendary bus on the road, especially while living in Hackberry, and once in exchange for services he added the sweeping mural. The owners of TNT have preserved the artistry and added a small gallery of Waldmire’s world famous work, some of which was created specifically as a gift. his book at TNT Engineering. 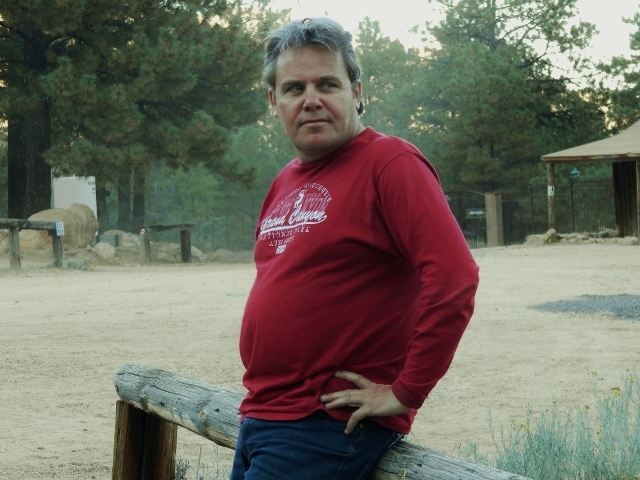 Shortly after bidding adios to Akio and his family, I received a call from Jan Kuperus, a friend from the Netherlands who is a co-owner of U.S. Bikers. This was a most pleasant surprise as we haven’t had an opportunity to visit since sharing a cabin and working at the holiday fair in Utrecht Netherlands this past January. We started our evening visit with the always pleasant drive into the Hualapai Mountains even though the Hualapai Mountain Resort is closed on Tuesday. We always enjoy introducing visitors to this pine shaded oasis in the desert that is a mere twelve miles from Kingman. The pine scented breezes, the clean mountain air, the delightful conversation, and a visit from a herd of elk made for a most pleasant evening that stimulated the appetite. Our visit was topped off with a delicious dinner at Redneck’s Southern Pit Barbecue. Our international week continued this morning when we met Zdnek Jurasek and his wife Eva of the Czech Route 66 Association, and their tour group for breakfast at Mr. D’z. As Zdnek and his wife were inductees into the walk of fame this year, Mayor Richard Anderson, Police Chief Robert DeVries, and Dora Manley turned out for a special presentation followed by walk to see the brick placed in their honor along Andy Devine Avenue, Route 66. It is celebrations such as this that are the highlight of our Route 66 adventures. The busy schedule continued after breakfast, first with some much needed Jeep service, and then a meeting with the marketing manager at Ramada Kingman. Plans to make this Kingman’s only Route 66 resort are moving forward. 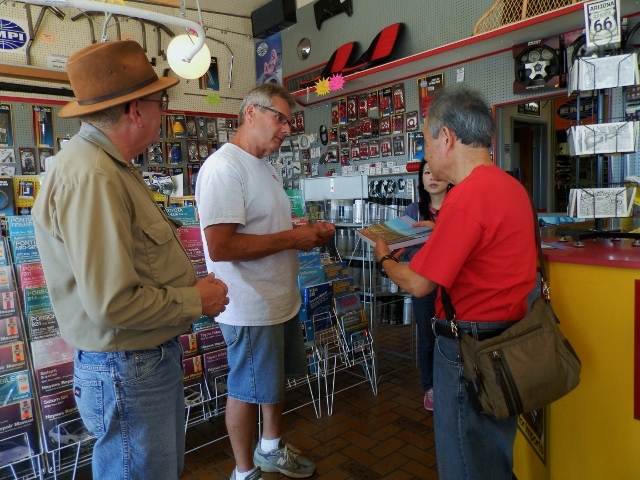 From area tour packages to special events the historic full service facility can enhance any Route 66 adventure that includes a stop in Kingman. To wrap this hope, I would like to share a letter of thanks that was submitted to the Kingman Daily Miner. I was quite honored to be selected the 2015 King of the Mother Road at the 1stannual Best of the West on 66 Festival. This as well as my inclusion in the Route 66 Walk of Fame during the 2014 Route 66 International Festival were bestowed in recognition of my contributions to the promotion and preservation of Route 66, America’s most famous highway and its longest attraction. My accomplishments, however, are resultant of a partnership that has spanned more than three decades. To my dearest friend, thank you for the support, the encouragement, the insightful wisdom, and the patience. They are also attributed to some very special people in Kingman that make it easy for me to promote the city. Ron Giesbrecht, thank you for serving as my chauffer during the Andy Devine Parade, and your work to ensure we have an event like Chillin’ on Beale. I also need to express my thanks to you and everyone who provided transportation for our Dutch visitors, to everyone who contributed to the refurbishment of the truck for Ashley Walker, the people who turned out for the presentation, and those who organized the event, thank you. Ralph Bowman, and all who contributed of their time and labor, as well as the materials for the refurbishment of “Jingles”, our historic police car, thank you. 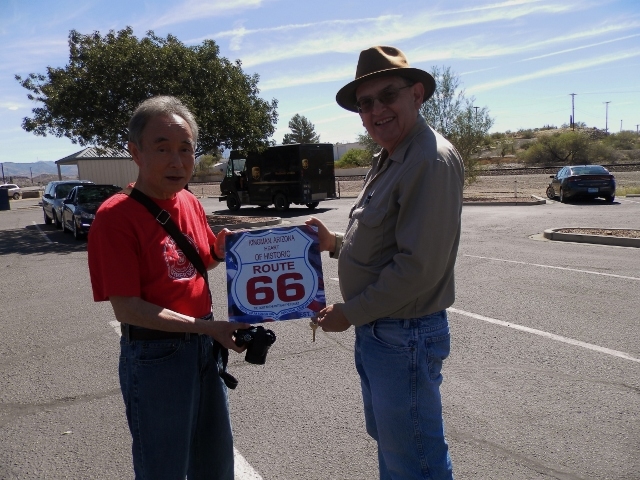 I would also like to thank the Route 66 Cruizers, Kingman Area Tourism, Arizona Route 66 Association, and Route 66 Association of Kingman for hosting the reception for the 2nd Annual National Route 66 Motor Tour on October 16. To Police Chief Robert DeVries, the Kingman Police Department, Mayor Richard Anderson, and City Manager John Dougherty, your leadership and tireless work to ensure Kingman is a city with a bright and prosperous future is greatly appreciated. To Dora Manley, Julie Lowe, and all involved with the recent Best of the West on 66 event, congratulations on a job well done. Scott Dunton, reorganization of the Route 66 Association of Kingman, the Celebrate 90 initiative, the cleanup and transformation of the corner of Fourth Street and Andy Devine Avenue, and the renovation of neon signage, has me looking 2016 with eager anticipation. The owners and management of Ramada Kingman also deserve special mention. From the transformation of the property to the hosting of the reception for our Dutch visitors, thank you for helping make Kingman more than a stop on the way to somewhere else. Sam and Monica of the El Trovatore Motel, Dennis and Herberta at the Hill Top Motel, and the countless dozens of people who work behind the scenes, you make it a pleasure to promote Kingman, and a joy to tell folks during my travels that I call Kingman home.